This touring exhibition is a showcase for contemporary currents in print, including printmaking, photography and digital. Guest curators for this premier biennial are: Christine Style, Professor Communication Arts/Art (UWGB) and Dr. Stephen Perkins, Academic Curator of Art (UWGB). After its initial showing at the Lawton Gallery, University of Wisconsin-Green Bay, the exhibition will start its tour at the beginning of 2005 and continue through May 2006. This tour will consist of approximately eight to ten institutions across the country. An on-site collaboration with the public. During the opening, while the artist slept, the viewers/audience/participants were invited to make a mark and document their names. Over the course of the following month, Misha completed the 81 works that began from their initial marks. During the Residency at the gallery the public interacted with and checked up on Misha and his progress, where he was "on view" working each day, and/or via a webcam, at galleryAD.com. Misha's work was showcased at the closing reception. The exhibition brings together artists working in diverse media - chosen by a panel of artists, art historians, and museum professionals - whose works are featured in the 2005-06 line of Art Bars. The Inner Sunset Mural Project is an outdoor, public exhibition space featuring a rotating cast of artists from our neighborhood and beyond. It is located just down the block from Receiver. From Paris 1925, New York 1993, to San Jose 2005! PAN "Love & Chaos Revisited"
Over 50 artists celebrate and decry the notion of Valentine's Day in both 2 and 3-D media. Experimental project addresses questions that are frequently asked about art and its presence in museums and provokes visitors, as well as Center staff, to think in new ways. Objects illustrate questions that have no simple or "correct" answer and that lead to continued exploration, such as "What is artistic quality?" or "Who decides what is art or who is an artist?". ReFresh Print Biennial 1 is a new initiative to take a fresh look at the range of contemporary currents in print.This touring exhibition is a showcase for contemporary currents in print, including printmaking, photography and digital. The Sacred Art Festival is an Annual Event which generates considerable intrigue in the Bloomfield Community. National Exhibition of artists explorations of The Sacred. Representing diverse interpretations, both traditional and nontraditional. Review by Kurt Shaw, Pittsburgh Tribune Art Critic "Art of the sacred"
International Juried Art Competition showcasing artists world-wide with a personal and original artistic vision. This exhibition presented the creative results of cutting-edge artists working in photography, computer enhancement, and digital manipulation. Works on paper by emerging artists from throughout the country. Over 600 works by 126 artists representing 23 states. First annual South Bay Art Momentum Exhibition presented works by over seventy South Bay Area artists. 05/14/2004 Entry: "Gallery Row L.A." If you're in the L.A. area this Saturday, spend some time downtown at the Gallery Row unveiling party. We helped them set up a version of Phantom Galleries you can check out, and there will be a crazy amount of events happening all day. 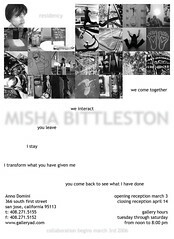 Misha Bittleston will be the featured artist in our Phantom window. "Can I Call You a Nobody?" 13266B Highway 9, Boulder Creek Calif. Sponsored by Neiman Marcus Group Inc. Patrons: Sir Geoffrey Johnson Smith D.L. M.P. & Tim Renton M.P.